Every year, nearly 20,000 dogs and cats enter Orange County Animal Services (OCAS). The majority of these animals are strays with no known background. Others are pets surrendered by their families, and occasionally, some are rescued from abusive homes. OCAS is the largest and only open admission shelter in Central Florida, which means no animal is ever turned away. With a mission to protect the health, safety and general welfare of Orange County citizens and animals, Animal Services offers a variety of critical services, including adoption, volunteer program, foster care program, animal welfare enforcement and educational workshops. By providing these services, OCAS hopes to give abandoned and neglected pets a second chance to live long, healthy lives in safe, loving homes. Last year, OCAS had 7,842 adoptions, which surpassed its euthanasia total for the first time since it opened in 1969. Considering the amount of strays that enter the shelter every year, this is a significant achievement. In order to increase the number of adoptions, many of the shelter animals are taken to partnered PetSmart and Petco stores to increase the number of potential adopters who actually see them. Adoption fees are kept low — $55 for a dog and $40 for a cat — and there are often promotions offered to reduce fees and encourage people to adopt. Animals that are more than seven years old are free to adopt, including dogs with heartworm disease. All military veterans can also adopt for free. In addition to shelter promotions, OCAS works with almost 100 animal rescue organizations across the state that take in animals that struggle with behavioral and medical problems. Summers explained that many people actually want to adopt shelter pets, but the challenge is they have preconceived notions regarding what type of pet they want to adopt. “Our adopters literally save lives and understanding that makes people much more open to adopting an older pet or a breed they never considered before,” Summers said. One of the keys to the success of Animal Services is its volunteers. According to Carolina Devine, OCAS Public Information Officer, volunteers are the glue that keep the shelter running at such a high level. If you’re interested in volunteering at Orange County Animal Services, simply go to Orange County Animal Services and fill out an application. 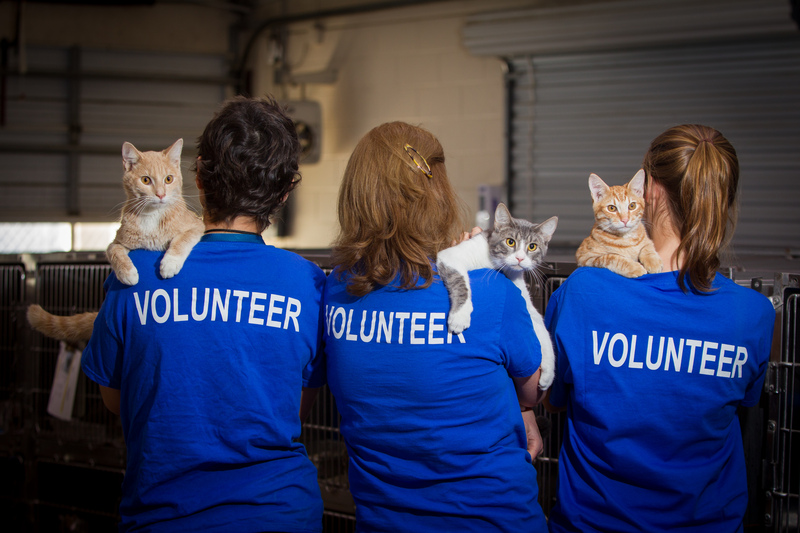 After a short orientation and animal handling training, you can begin your volunteer work by helping potential adopters interact with the cats and dogs, greeting people at the front desk, assisting at offsite adoption events, or helping take photos of the shelter pets. Orange County welcomes volunteers 16 years and older to volunteer at OCAS. Fleur de Lys Healy, aka “Grandma,” is the oldest volunteer at 85. She was born in 1930. Beth Otto is the longest-tenured volunteer having started in 2009. She is also very active in the foster care program and has fostered approximately 400 cats. OCAS currently has 388 active volunteers and is always looking for kind-hearted, nurturing individuals who want to help pets find forever homes.